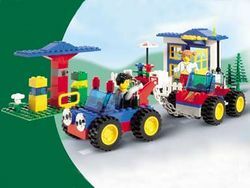 4120 Fun and Cool Transportation is a Limited Release Creator set that was released in 2001. The set comes in a 603-piece blue tub supplied with no lid. Two Jack Stone figures are included, Max and his sister Tina. It's recommended for children aged 4 through to 9. Facts about "4120 Fun and Cool Transportation"
This page was last edited on 29 April 2016, at 16:54.